Your journey into the past begins as you depart from the Maritime Station. Passing Mount Vesuvius, as you drive to the Amalfi Coast, admire the dolomite cliffs, towering straight up out of the sea, and typical villages, which have characterized Sorrento's Peninsula for many centuries. Pause for a photo opportunity at a vantage point to admire Sorrento's coast. Drive along the steep winding coastal road passing Positano, a fishing village that has become something of a colony of artists and writers. 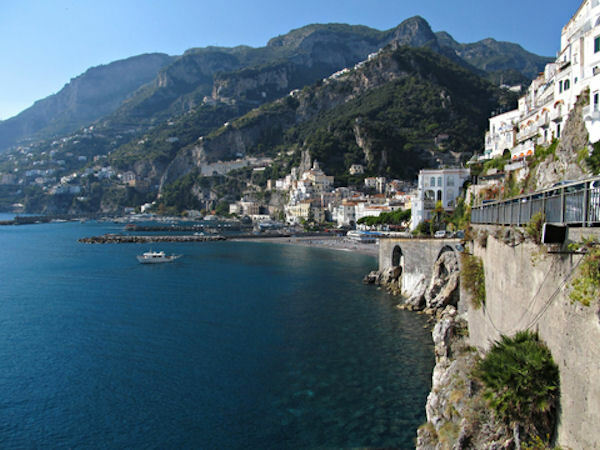 The picturesque seaside resort of Amalfi lies at the mouth of a deep gorge. It is one of the most popular holiday resorts in Italy. You will have time to take photos and stroll along the narrow streets to the Piazza del Duomo. From this square, a flight of 60 or more steps leads to the impressive Cathedral of St. Andrew. The interior of the church dates as far back as the 13th century with the highlight of the cathedral being the 11th century bronze doors from Constantinop. On the return journey we will stop for a guided tour of the ruins of Pompeii. You will enter the fabled city through the Sea Gate as you experience a walk down the cobbled street to the Agora, surrounded by temples, porticoes and law courts. It was the religious, civic and business center of the city. Because Pompeii was so well preserved, you can see many fine details that reveal the lifestyles of the residents, such as mosaic floors and colorful frescoes in some of the homes. As you wander through this ancient city, you can't help but notice the still-active Mount Vesuvius towering above. Please note the roads on the Amalfi Coast are narrow and winding. Passengers who suffer from motion sickness should take this into consideration. Remember to bring your camera. Please note that roads on the Amalfi Coast are narrow and winding. Passengers who suffer from motion sickness should take this into consideration.